Camel is the identity of the desert it is known as the ship of the desert. Once known as an ugly animal it is now rejoiced and pampered in Dubai as an elegant character. Camel races in UAE have always been talked about in different ways but the actual camel race is a sport to be seen with joy and great appreciation of this beautiful animal. 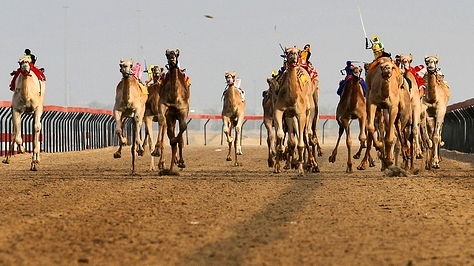 The camel races in Dubai are a regular feature it is held at Al Lusali Club every Tuesday and Wednesday at 7:00AM and 15:00 hrs PM the races are usually between 10 - 15 camels and eavery race receives a prize from the royal family. 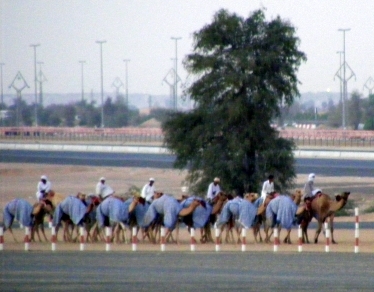 Exotic Dubai has organized tours for these camel races. 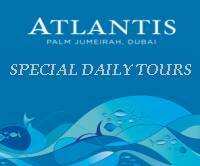 We are the only tour operator in Dubai who has such tours running regularly. Details of Camel Race tour are as under. Pickup at your hotel or residence in Dubai between 1:30 to 2PM drive on Alain road to Al Lusali club race begins at 3PM you will be given seats to watch the race and you may take pictures or movies from any side. Race finishes at 5PM and prizes are distributed. As the race ends we drive you back to Dubai while you can also stop at one of the camel farms to see the camels being raised. Pickup at your hotel or residence in Dubai between 6:00AM drive on Alain road to Al Lusali club race begins at 7AM you will be given seats to watch the race and you have opportunity to take pictures or movies from any side. Race finishes at 9AM and prizes are distributed we than drive back to Dubai while you can also stop at one of the camel farms to see the camels being raised. 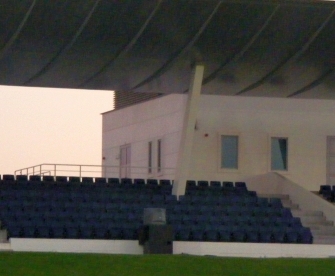 Pickup at your hotel or residence in Dubai between 1:30 to 2PM drive on Alain road to Al Lusali club race begins at 3PM you will be given seats to watch the race and you are allowed to take pictures or movies from any side. Race finishes at 5PM and prizes are distributed we than drive back to Dubai while you can also stop at one of the camel farms to see the camels being raised.